It's nice when online slots developers mix things up a bit, whether it's After Night Falls by Betsoft Gaming, or wacky versions of classic stories like Playtech's The Three Musketeers and the Queen's Diamond. Whatever - the developer's bizarre sense of humour seems to be in evidence in Piggies and the Wolf. In one of renowned developer Playtech's best 3D intro sequences, the slot sees a cool wolf in a leather jacket with breath freshener at the ready and a glint in his eye as he prepares to huff, puff, and blow the pigs' houses down. In the straw house there's a stoned Rasta pig, in the house made of sticks we find a banjo-strumming pig, while the house made of bricks sees a rap star pig. The first thing to note about Piggies - other than the wacky take on the classic story - is the paylines. There are 50 in total - all fixed - and coins range from $0.01 to $5.00. As well as 10-to-Ace symbols on the reels - here decked out in various characters' attire like a woolly hat and a neckerchief - we get the three houses and the three pigs. The Wolf is Wild... Obviously! Naturally, there is a Wolf icon too (acting in the game as the Wild) and he substitutes for all regular icons other than the Scatters and Bonus icons. He appears stacked on Reel 5, and if you manage to cover the entire reel in Wolf Wilds he will randomly huff and puff his little heart out at various symbols. Any symbols he blows will shuffle to leave you with some nice bonus winning combos. 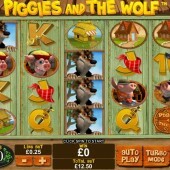 Three Piggies and the Wolf Scatters on Reels 1, 3 and 5 triggers a free spins round. Wins are doubled on the 15 freebies you'll bag but you also benefit from the 'Pigs Running Wild' feature. During free spins, if you land a Wolf to the immediate right of one of the piggies, he will chase the pig off the screen, leaving a trail of bonus Wilds in his wake. Hitting three further Scatters on Reels 1, 3 and 5 triggers a further 15 spins. Finally, the Blow the House Down Bonus is triggered by hitting bonus icons anywhere on Reels 1, 3 and 5 at the same time. On a second game screen, the Wolf gets to do his thing for proper as he tries to blow down the Straw, Sticks and Brick houses in order. However, before each blow you get to select a special move for the Wolf to try out in order to help him in his efforts. If you make it all the way to the brick house you could be in for a mammoth jackpot. Despite the bonuses being a little tricky to hit, having four rows in the game makes regular wins more likely - especially with the Stacked Wilds on Reel 5. I particularly found myself hitting plenty of 4-and 5-of-a-kind combos on the reels during the base game. But the Blow the House Down bonus is a real hoot (watch as our big bad wolfie friend tries to blow down the stick house with a well-timed bullfighting move). 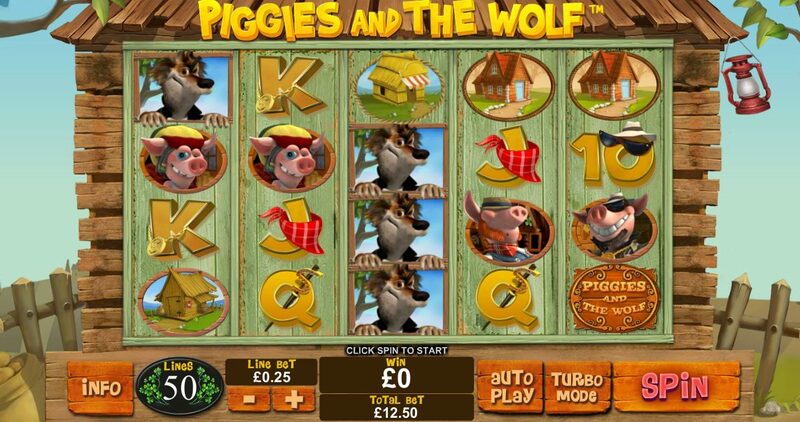 Make a beeline for your nearest online casino offering Piggies and the Wolf - you won't regret it.